Frameless shower glass doors are becoming one of the more sought-after	designs in today’s modern master bathrooms. 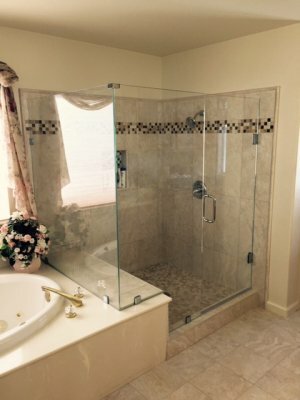 At	Blossom Hill Glass, we specialize in helping our clients design and implement the shower	of their dreams, as well as provide top-quality installation of 3/8″-1″	shower doors to create the perfect look. Our creative team of consultants	and installation professionals are skilled at working with clients of	all budgets and tastes. No matter the size or dimensions of the bathroom,	we can take a dream shower plan and mak e it a reality. Call us for the best in value and quality! Free quotes available. Bathroom remodeling can be challenging, but highly rewarding in the end. Our team is known for our high quality products, installation, and leading	shower door services. See why so many of our customers have chosen us	time and again for their glass needs. doors,	contact Blossom Hill Glass at (408) 628-7500. Request a quote here	!